Having read and been so impressed by several of Margaret Atwoods works of fiction, I imagined that a book written by her about the art or activity of writing would prove to be an interesting read. As explained in the introduction and prologue to the book, the chapters here are based on the Empson Lectures given by the writer at the University of Cambridge in the year 2000. Chapter 1, entitled Who do you think you are? 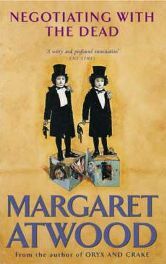 is mainly autobiographical, tracing Atwood’s early years from her birth in Ottawa in 1939 up until her undergraduate student days at Victoria College, the University of Toronto. I found it an enjoyable read that eased me into the book, as I learned how Atwood and her brother whiled away the hours taking turns at storytelling, and how she became an avid reader of everything from novels by Jane Austin or Edgar Allan Poe to True Romance magazine. She wrote very little until the age of seventeen, and it was to poetry that she first turned her hand. At the close of this chapter, she considers the fact that the art of writing is an accessible one for most people: opera singers have to have a voice, dancers have to be fit, but, as Atwood remarks, ‘most people secretly believe they have a book in them’. She then uses the analogy that anyone can dig a hole in a cemetery, ‘but not everyone is a grave-digger’. Similarly, not everyone who writes can be a Writer with a capital W.
The remaining chapters of ‘Negotiating with the Dead‘, as Atwood explains at the outset, are not arranged in any particular order and one does not necessarily lead naturally into the next. In Chapter 2, The jekyll hand, the hyde hand, she examines the fact that the writer appears to be two separate entities, one that writes and perhaps becomes well known, the other that ‘does the living’, in other words the mundane everyday activities that perhaps the public does not associate with a writer. It was perhaps at this point that I began to realise that the main focus throughout the book tends to be on novelists and poets rather than on journalists or writers of non-fiction books. Chapter 4, Prospero, the Wizard of Oz, Mephisto & Co., considers writing as a discipline as well as a craft, and looks at the artist or writer in relation to society, asking whether he/she has a responsibility towards it. It is amusing to read that Atwood always wants to ‘run a mile’ (although she doesn’t always manage to) when asked to take part in panel discussions that are devoted to the subject of the ways in which artists/writers ought to be ‘good for’ society. I was particularly interested in this chapter with the idea that each reader will interpret what the writer has written in a particular way, and that this is beyond the control of the writer. ‘But the reader will judge the characters, because the reader will interpret… Language is not morally neutral because the human brain is not neutral in its desires.’ It therefore follows that it is the reader who will decide whether or not the writer’s work is relevant. Chapter 5, Nobody to Nobody, focuses on who the writer writes for, and at one point examines the quandary of the writer of a successful work who has to decide whether or not to ‘Repeat yourself and satisfy Them, or do something different and disappoint Them.’ The chapter concludes with the idea that the writer writes for a real person, and in the case of the novel ‘Cat’s Eye’, it was for Atwood’s Brownie pack leader, or Brown Owl, from her childhood – a very human touch. I have to admit that Chapter 6, Negotiating with the Dead, was probably the least interesting for me, but I can imagine it might be the most interesting for other readers. It deals with the idea that perhaps all writers are motivated ‘by a fear and a fascination with mortality’. I can relate to it in terms of wanting to leave something behind, although even that is not something I personally feel motivates me at the present time. I can imagine it may do so increasingly as I get older. However, the chapter goes on to explore superstitions revolving the dead: the idea, for example, of leaving food out for them at night to appease them. It is an interesting subject, I know, but it doesn’t somehow quite fit with the book as a whole for me. The fact that the Notes and Bibliography between them run from pages 163 to 186 gives an indication of the scope of the literary references included in this slim volume. They cover a vast range of sources, from the Bible to D. H. Lawrence, or from Ovid to Ray Bradbury – there is something for everyone to relate to somewhere here. Although essentially a serious work of non-fiction, there is quite an element of humour within these pages. Atwood comes across both as a very human woman ‘a dab-hand at cookies, beloved by domestic animals’ and a highly educated, well-read, cultured figure – the essence of the duplicity that was the subject of the second chapter. There are certainly some interesting ideas here, particularly as I have said for the writer of novels or poetry, but for anyone with a serious interest in literature as well. I can imagine it is a book I will pick up again and again in the future, perhaps concentrating on one chapter at a time and dwelling on the ideas rather than rushing to read it from cover to cover. No Comments on "Negotiating with the Dead"